Ringo Starr, Vegas lounge singer? 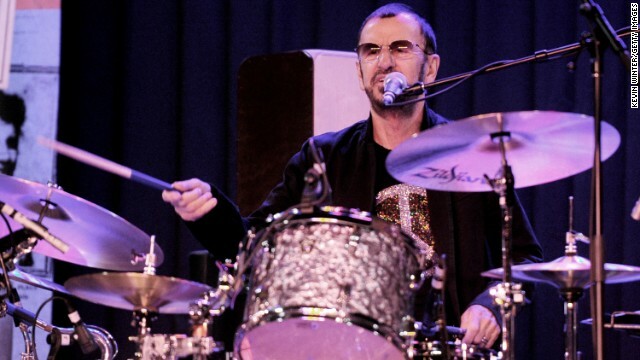 Former Beatle Ringo Starr may be the latest music legend headed toward a residency in Sin City. The 73-year-old drummer-turned-frontman hinted at the possibility Tuesday at a press conference in Hollywood to announce Latin American tour dates for Ringo and His All Starr Band. "You mean like 'The Golden Drums?' Like - what is it - 'The Red Piano?'" he quipped, invoking the name of Elton John's Las Vegas show. "It's been talked about, but nothing's been finalized. We have a couple years before that happens, I believe. So what is the answer? Not yet." The Beatles already have a strong track record in the Nevada gambling capital. The Cirque du Soleil production "Love" - which features the music of the Fab Four - has been a staple on The Strip since 2006. If Starr headlines at one of the major hotels, he'll join the ranks of Motley Crue, Shania Twain and Boyz II Men as iconic artists who've recently set up shop in Vegas. According to Forbes, Britney Spears - whose "Piece of Me" residency kicks off December 27 at Planet Hollywood - will pull in roughly $300,000 per night. Although Starr's show will likely be smaller in scale, putting down roots in Vegas would allow the entertainer a respite from the road, especially since it's a mere one-hour flight from his home in Los Angeles. Is Beatlemania alive and well? Judge for yourself. Tuesday's press conference was briefly interrupted when someone in the back of the room fainted. "But that's different," Starr explained with more than a bit of concern. "The man was diabetic." Why not? Though John Lennon wasn't crazy about if the Beatles were fading away. Have you ever seen Ringo and his All-Starr Band perform? It's a pretty good show. But maybe you're 12 and Miley and Justin are more your speed. a couple of years away? He'd better hurry. He's not getting any younger! Gotta love, Ringo!!! Fabs rule!! !